Stacy Horn » Blog Archive » Who doesn’t love a fort? Who doesn’t love a fort? 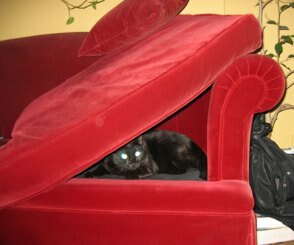 The second a fort is provided, a cat jumps in to occupy it. So today I’m going up to the American Society for Psychical Research to use their library. Normally this would be a nice thing, going up to a library (I love libraries) and then taking a nice long walk home. But New York and other places are about to be burned off the face of the earth and I don’t want to go out there! Oh God, the subway. What fresh hell will that be like?? Well, who knows what wonderful surprises I will find in the library so I will concentrate on that. I’m going to leave the air conditioner on for the cats, even though they’re begging us to conserve. I don’t have the heart to turn it off in this kind of heat, though. I don’t want them to suffer.